Pronunciation: /ˈmæð·ə·gæn/, alternative spellings Madhagan, Mathagan. Maðagan is a heavily-cratered world about the same size of Mars. It is a dense world with a large metallic core and a thin atmosphere. The name Maðagan is of Icelandic origin. Serna is a world whose radius, mass and appearance are very similar to Venus. Its atmosphere is thinner than the atmosphere of Venus, and it is tidally locked to its sun unlike Venus. Despite these differences, it takes an expert to distinguish Venus and Serna from space. 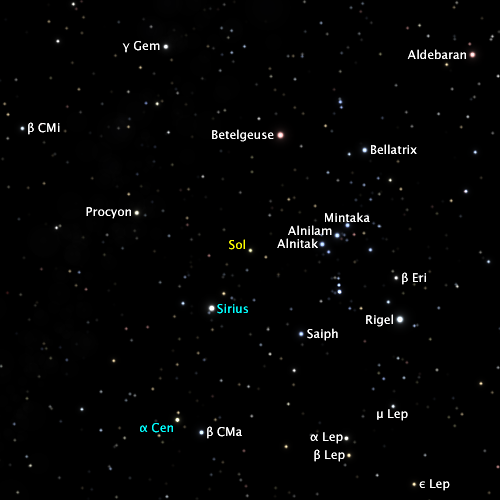 Serna is the largest planet in its system. Lacandia is a terrestrial world with rings. When Lacandia was discovered in 2974, it was an icebound world trapped in a global ice age. The world was covered in ice more than two kilometres thick even at the equator. The world had never experienced global melting, and had only primitive life forms subsisting in a few places on the seafloor where hot springs poured heat and nutrients into the surrounding waters. The world had a primordial atmosphere composed mainly of nitrogen, methane, ammonia, carbon dioxide and argon. After terraforming, the world became quite hospitable to terran life. The native life also flourished in anaerobic environments. The most notable feature of Lacandia is its bright and prominent ring system. Rings around terrestrial planets are unusual because such ring systems are generally short-lived. The Lacandian ring system appears to be of recent origin. Scientists believe that the ring system probably formed approximately one million years ago when a moon broke up within the planet’s Roche lobe. The rings will not last indefinitely and have been shown to be unstable in the long term. The rings are known to be slowly losing material as dust particles and other debris from the rings have been found entering the atmosphere from the rings in the vicinity of the equator. 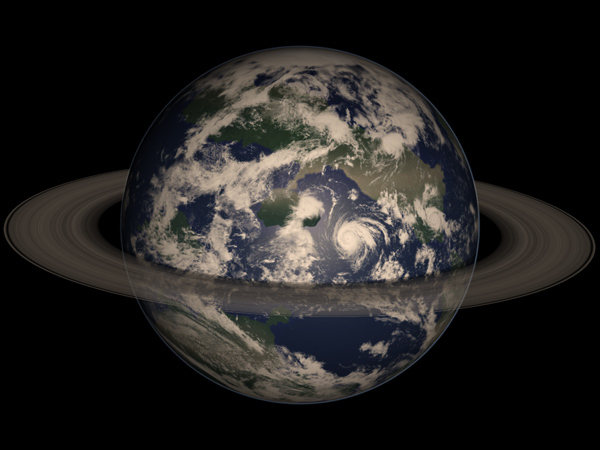 The rings have a noticeable effect on the climate of Lacandia. Lacandia is substantially cooler than it would be without rings because the rings block some of the sunlight that would otherwise have struck the planet. The sunlight is partially blocked from the winter hemisphere of the planet, which causes Lacandia to have seasonal extremes that would more commonly be seen on a world with a substantially larger axial tilt. Two small moons orbit within the outer parts of the rings. The moon Athor orbits within the Athor Gap of the rings, and is responsible for the Gap’s existence within the rings. Kata orbits just outside the outer limit of the rings. Both moons are irregular, have a largest diameter of less than ten kilometres and complete their orbits in less than three hours. Like the rings themselves, these moons are also doomed to destruction within the next few million years as they approach the planet and break up. The destruction of these moons will regenerate the ring system, which by then will have faded to a faint vestige of its former glory. Veren is the third satellite of Lacandia. It has a diameter of about 1080 kilometres and has an apparent size in the skies of Lacandia about four-fifths the size of Earth’s moon in the terrestrial sky. Veren orbits Lacandia with a sidereal period of about 6.69 Standard days, or about 6.98 Lacandian days. The traditional seven-day week of Earth is well-suited to Lacandia, where the seven-day week is closely approximated by one full orbit of the moon Veren with a mean lunar month of about 7.15 Lacandian days. Traados is an ice-covered world with a mass about one-quarter of an Earth mass. Imagination is vaster than all of space. 70 Ophiuchi in Wikipedia: Stars and planetary systems in fiction. 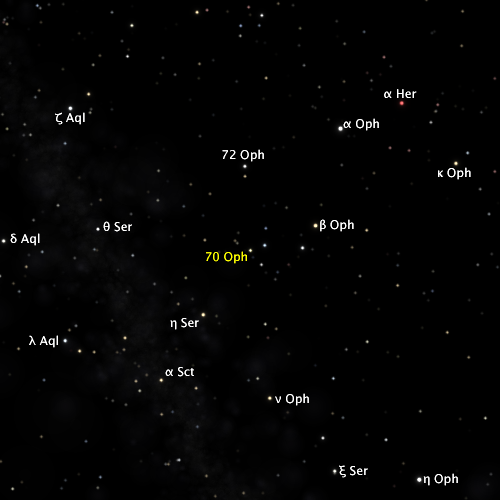 70 Ophiuchi A and 70 Ophiuchi B in the ARI Database for Nearby Stars. 70 Ophiuchi in the Bright Star Catalogue. is in the Encyclopedia of Suns. 70 Ophiuchi in the Internet Stellar Database. 70 Ophiuchi in the SIMBAD Astronomical Database. This document was last modified 2011-01-12 00:23:10 UTC. Copyright © 2004-2011 Bruce Mills. All rights reserved.